Loving Moore: Busy CRIMINAL MINDS Star Attends ~~ Everything! If there is a charity event, opening, or awards show, CRIMINAL MINDS star, Joe Mantegna, seems to be there. He is a man who should be applauded for his patriotism and charity work. If it is a worthwhile event, look for Joe. Most recently, he turned up at Gordon Edelstein's revival of Tennessee Williams' "The Glass Menagerie," opening on September 12 at the Mark Taper Forum in Los Angeles. 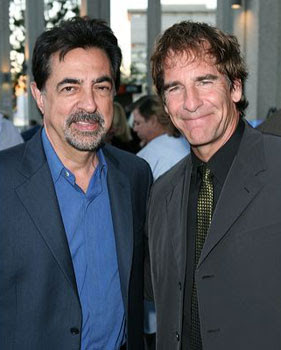 He is pictured about with Scott Bakula, who was also among the celebrities attending. On September 11, Joe and his beautiful daughter, actress Gia Mantegna attended the premier screening of "Fred: the Movie," based on the popular internet character. The movie was shown at the Paramount Theater in Hollywood, CA. It will premier on Nickelodeon TV on September 18.